Ender’s Shadow is not a sequel to Ender’s Game. Rather, it is what Card calls a “parallax”, retelling the events in Ender’s Game from a different point of view. The point of view is that of Bean, a relatively minor character in the original novel. Readers of that book will recall Bean was one of the children under Ender’s command, a physically tiny yet intelligent child. Naturally, since they tell the story of the same war, several scenes are shared between Ender’s Game and Ender’s Shadow, but each book presents these with a different focus. Once again, Card proves to be a master storyteller, and the two books end up being beautifully woven. Identical dialogues and scenes suddenly gain a whole new meaning. Whatever minor incompatibilities there might be between the books are explained by Card as a result of the different viewpoints; these are, he says, “features, not bugs”. Card claims the two books can be read in any order -- neither is a sequel of the other -- but I suspect the enjoyment would be more complete if the books are read in the order of their publication. 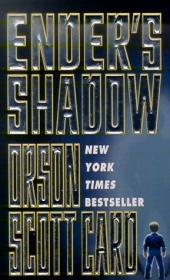 Ender’s Shadow is a spellbinding book, much like Ender’s Game (and in many ways unlike Ender’s Game’s three sequels). Anyone who enjoyed the original book will almost certainly enjoy the new one just as much. However, while many readers of Ender’s Game could identify their childhood with that of Ender, no reader of Ender’s Shadow will be able to identify his life with that of Bean. This alienness could somewhat detract from the readers' enjoyment. Bean’s speculations about the intrahuman wars to come after the Buggers are defeated provide a highly fertile ground for sequels. Unlike the previous sequels to Ender’s Game, these should take place in the future shortly after the story of Ender’s war. They should tell the story of Bean, some of his fellows from Battle School (and Rotterdam), and of course Peter the Hegemon, Ender’s brother. If Card will not fall into some of the traps he encountered with the previous sequels, then this is one book I’m looking forward to read; all in all, the universe presented in the Ender series is truly a fascinating one. The Ender universe includes an instantaneous communication device which enables the children to control ships in real-time from light years away. Instantaneous communication is a common theme in SF. In some cases, the communication was enabled by using twins that had a psychic connection; but in most cases, the enabled device was a physical invention, and it is almost inevitably called “ansible” -- including in Card’s books. The name “ansible” was originally presented by SF author Ursula K. LeGuin. Her classic book The Dispossessed is hardly focused on technology, but it does tell the story of the device’s inventor. Should any scientist in the real world ever invent such a device, he'd better call it an ansible. Otherwise, he'd have the whole SF community to face.